“I’m happy for them,” Fletcher said. 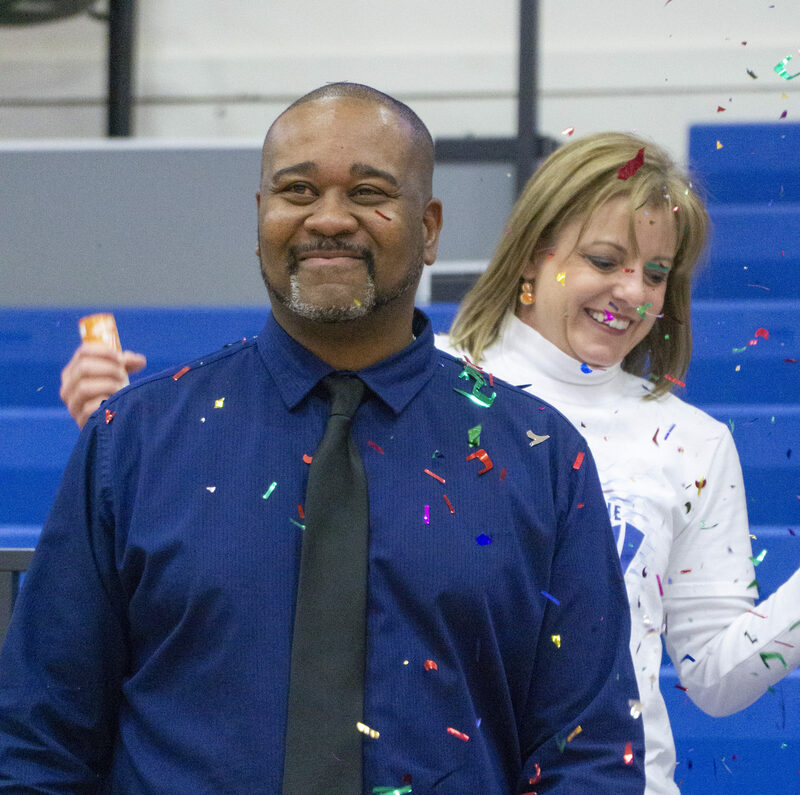 “At the end of the day, it’s all for them.” Coach Anthony Fletcher earned his 300th career win with a 112-76 blowout over Cedar Valley on Jan. 26. Photo by Yesenia Alvarado/The Et Cetera. Head basketball coach Anthony Fletcher earned his 300th career coaching win with a 112-76 rout over Cedar Valley College. The Saturday home game saw employees, former players and more come out to support Fletcher. Coach Anthony Fletcher gained his 300th career win after Harvesters defeated the Cedar Valley Suns, 112-76 on Jan. 26. Photo by Rory Moore/The Et Cetera. Guard Rashaun Coleman attempts to score against Cedar Valley College. Coach Anthony Fletcher earned his 300th career win with a 112-76 blowout over Cedar Valley on Jan. 26. Photo by Yesenia Alvarado/The Et Cetera. Many students and employees, including volleyball team members, assistant to the president, Sharon Cook and Associate Dean of STEM Amy Vance showed their support for the Harvesters. Coach Anthony Fletcher earned his 300th career win with a 112-76 blowout over Cedar Valley on Jan. 26. Photo by Rory Moore/The Et Cetera. In honor of Fletcher’s accomplishment, Eastfield players did 300 total pushups after the game. Coach Anthony Fletcher earned his 300th career win with a 112-76 blowout over Cedar Valley on Jan. 26. Photo by Yesenia Alvarado/The Et Cetera. Forward Demauria Haywood has played 23 games with coach Fletcher. Coach Anthony Fletcher earned his 300th career win with a 112-76 blowout over Cedar Valley on Jan. 26. Photo by Yesenia Alvarado/The Et Cetera. “It was exciting to see us go out and play really good basketball because they got down the last two games when we lost on the road,” Fletcher said. “But road games are so tough, and I keep telling them, in this conference every possession matters.” The Harvesters previously lost against the Richland Thunderducks, 82-74, and Mountain View Lions, 104-96. Coach Anthony Fletcher earned his 300th career win with a 112-76 blowout over Cedar Valley on Jan. 26. Photo by Yesenia Alvarado/The Et Cetera. Motley the Harvester bee came out to show its basketball skills and dance moves during halftime. Coach Anthony Fletcher earned his 300th career win with a 112-76 blowout over Cedar Valley on Jan. 26. Photo by Yesenia Alvarado/The Et Cetera. Coach Anthony Fletcher celebrated with his mother, Olga Fletcher and associate head coach, Antonio Richardson. Coach Fletcher earned his 300th career win with a 112-76 blowout over Cedar Valley on Jan. 26. Photo by Yesenia Alvarado/The Et Cetera. Forwards Demauria Haywood and Scott Garriga dump water on coach Fletcher to celebrate his coaching milestone. Coach Anthony Fletcher earned his 300th career win with a 112-76 blowout over Cedar Valley on Jan. 26. Photo by Yesenia Alvarado/The Et Cetera.